Corn relish is good. Really good. It’s amazing on hot dogs and hamburgers, but it can accompany essentially any grilled meat, or be spread on sandwiches, or mixed with chicken salad, or even slathered on scrambled eggs or omelettes. Kids dig it the most. You don’t even have to go out and buy canning jars – as you can see from the picture, I just reused empty jars I had saved. This recipe is cribbed straight from Simplyrecipes.com, but I had to share it. I cut the sugar down to 1 cup, but the rest is perfect as is. 1 Working in batches if necessary, pulse the cucumbers, onions, and bell peppers in a food processor just 3 or 4 pulses, so they are still distinguishable from each other, not puréed. 2 Place mixture in a medium-sized (4 to 6-quart), thick-bottomed pot. Add the corn, tomatoes, sugar, salt, pepper, vinegar, turmeric, mustard seed, and ground cumin. Bring to a boil. Reduce heat to a simmer. Cover and cook for 25 minutes. 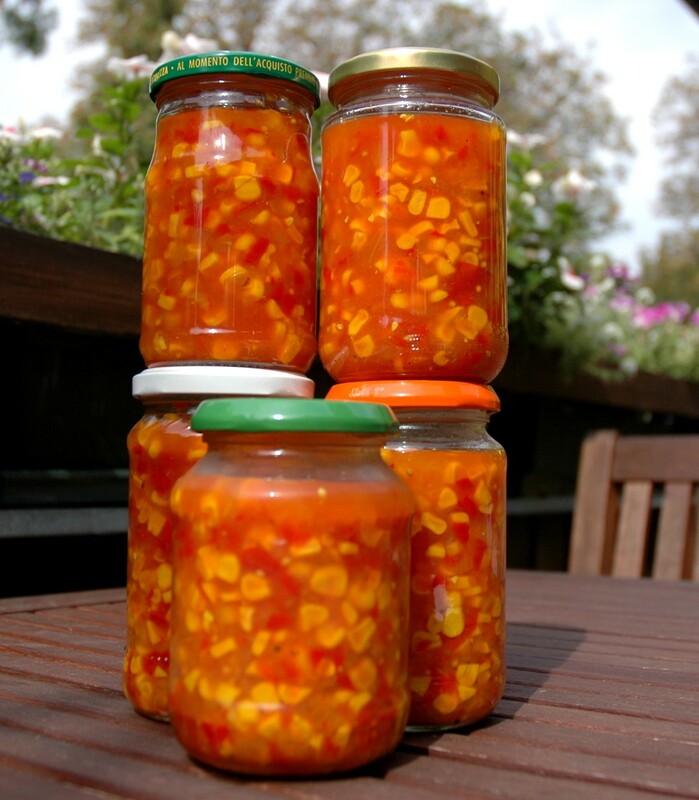 3 Spoon the corn relish into clean jars and seal. Will last for 4-6 weeks refrigerated. If you would like to store your relish outside of the refrigerator, sterilize canning jars before canning, and process the relish-filled jars in a hot water bath for 15 minutes after canning. YummY stuff from Field Notes From Fatherhood.